New at Standard Concession Supply...just in time for all your fall festivities! Featured here is Red Candy Apple Magic....definitely a fall favorite classic. Packed 18 one pound bags per case. Simple to prepare. Mix with water and sugar, cook, and dip your apple on a stick into this mix....and out comes eye catching lip smacking delicious red candy apples. 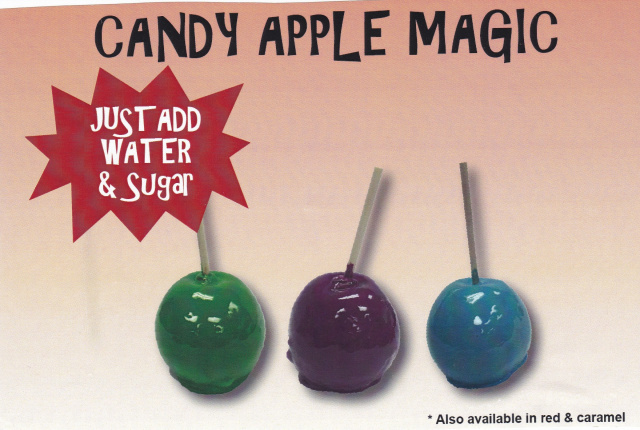 Flavored Candy Apple Magic. New exotic mouth watering candy apple flavors that include Blue Raspberry, Lime, Grape, and Caramel, and now Pink Strawberry! Packed 18 one pound bags per case. Same preparation is needed as for the red candy apple above. These new flavors will definitely increase impulse sales. Candy Apple Sticks. 5 1/2 Wooden Skewers. Packed 1000 Box. Additional discount for box of 5000 Count. Box of Twistie Twist Ties. Great for closure when wrapping candy apples with the candy apple wrappers. Red color. 2000 per box. GM Trans Fat Free Caramel is a very high quality Caramel Apple Dip...some of the best found anywhere. Packed four 5 lb. caramel blocks per box. Customers will flock to your caramel apples, and you will have repeat customers for life. Recommended to soften in a microwave and then melt in a caramel dip warmer. Hot seller for the upcoming fall season. Great compliment topping for caramel apples. These dry roasted chopped (granulated) peanuts are perfect and sized just right for caramel apples or baking & cooking. They also make great toppings for ice cream and salads. 30 lb case of granulated peanuts. Caramel and Candied Apples Window Decal. Caramel and Candied Apples Window Decal. Static Cling Decal dimension is 12" x 16". 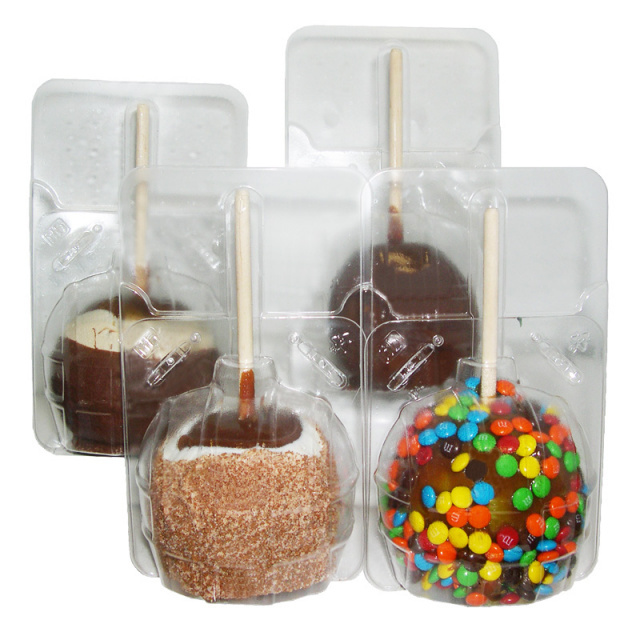 The decal will attract attention and bring more customers to your stand to buy more caramel or candy apples. The Paragon Pro-Deluxe Warmer is a great appliance to use for dipping your apples to produce delicious caramel apples. Best price found on the market for this type of appliance. Recommended to first microwave caramel blocks to soften it up... like in the featured GM Caramel Apple Block above After applied heating, the caramel should be the right consistency to dip your apple. Also great for placing a #10 can of caramel apple mix in. This unit feature a Stainless Steel Body, a lighted master ON/OFF toggle switch, and uses a 500 Watt Band Element with an adjustable thermostat to keep your caramel apple or other condiments at perfect temperature all day long.